With the arrival of spring, activity has shifted from pruning and repairs in the vineyard to the winery, where we bottled and released our 2017 Bacchus, Pinot Gris and Sauvignon Blanc with their new labels. We’re very happy with the new look and the quality of the wines. The wines were featured at the Locals Only BC event in March hosted at Edible Canada on Granville Island. The event was managed by our agent, Rich Massey, and was a chance to showcase island producers’ products with industry partners. 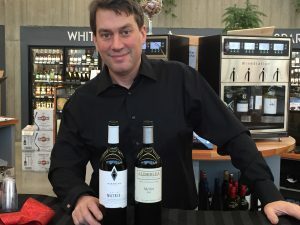 Zac and I had the chance to connect with existing and prospective clients, as well as wine writers like John Schreiner, one of the foremost authorities on BC wines. 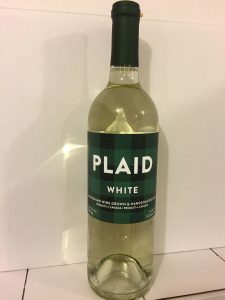 Here you can read John’s review of our wines. Also, in attendance at Locals Only was the host of Tasting Room Radio, Terry David Mulligan. 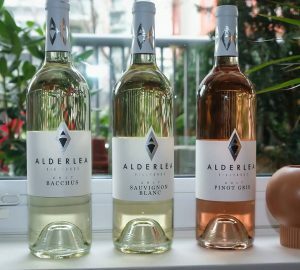 Listen to Terry’s interview with Julie about Alderlea’s wines. 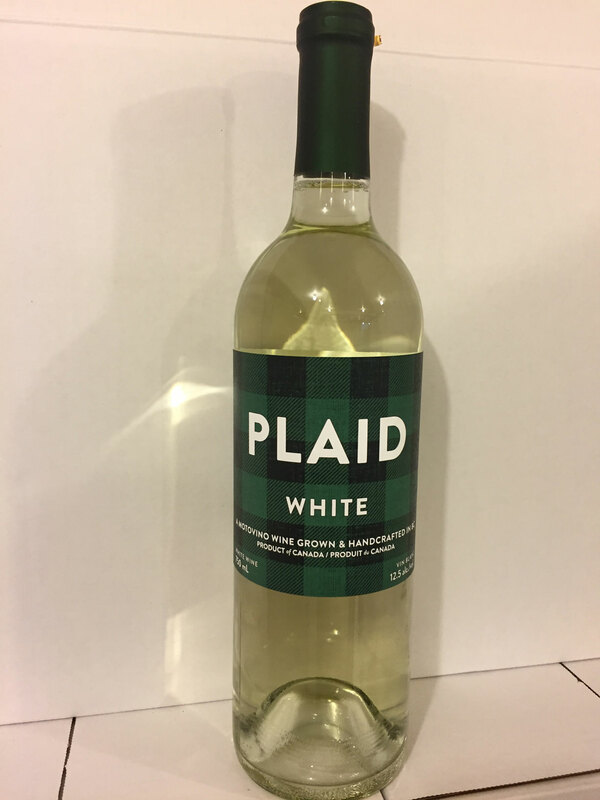 In addition to the 2017 Alderlea whites, we recently bottled and released a new addition to our Plaid family of wines: the Plaid Pink. 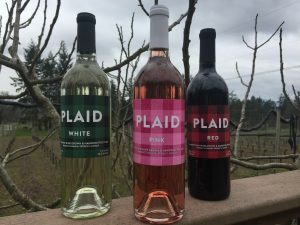 The Plaid Pink was launched in late March at the weekly Island Roots Market in Nanaimo and was a big hit a few days later at the Vancouver Island Market [insert photo]. Many thanks to Mei and Janice for their amazing efforts promoting this market and making it a great success! We look forward to future events with you. We are excited to move back into Beban Park with the Island Roots Market starting on May 16. Until then, you can find us every Wednesday at the Pleasant Valley Hall in north Nanaimo. While things have slowed down for us in many respects these last couple of months, there is still lots going on in the vineyard. 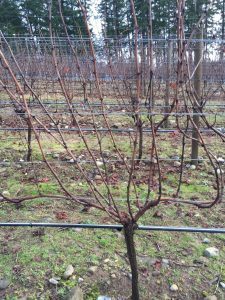 We have spent much of the last quarter pruning our vines and doing other maintenance tasks. We were fortunate to get some tutoring on the process from Roger and a few others (many thanks Frederic & Ingrid!) to guide us. 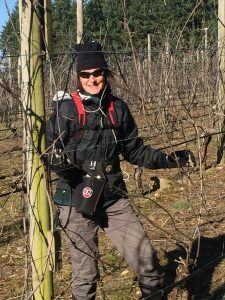 We also got a lot of great tips at the WIGA pruning workshop with Jessica Cortell from Oregon in January. Armed with loppers and hand shears, we set about our task, soon realising that doing an entire vineyard this way for one year, let alone the next 20, could very well do in our shoulders. We quickly invested in electric shears which make a huge difference from both a labour and speed perspective. They also look cool (LOL). January’s monsoon-like conditions made it tough to get much done but the fine weather in February allowed us to make real progress and we completed everything by early March. 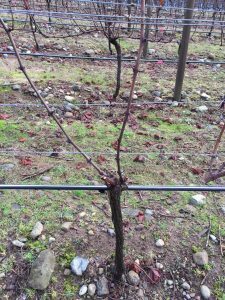 You also need to think beyond the current growing season and prune in a way that will help the vines to grow vigorously into a good shape for future years. There is something satisfying about pruning, probably because you see the output of your labour right away. So much of Zac and my previous work involved projects and initiatives where the outcomes or results were not immediately known or not necessarily clear-cut, no pun intended. 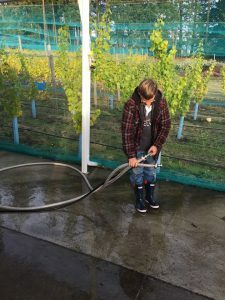 In addition to pruning and year-end accounting, we have also take a bit of time “outside of the fence” to pick up a new pump from McFinn Technologies http://www.americanwinepump.com/ in Portland, Oregon. Many thanks to Rob for his assistance with the purchase. The new larger 3” pump is bound to make life easier pumping grape must during our next harvest. Portland is a great city for food and wine, and on our way into town we were fortunate to stop at Cooper Mountain vineyards https://www.coopermountainwine.com/ in Beaverton and sample some terrific Pinot Noir with sales manager Michael. 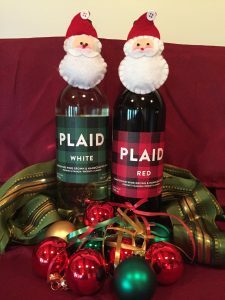 November passed in a blur composed primarily of winemaking activities and Christmas markets where we were selling our Plaid wine. 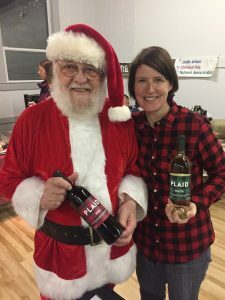 The Plaid labels in red and green lent themselves well to the Christmas themes at Kris Kringle in Nanaimo and Winterfest in Qualicum Beach. Our first harvest was a definite learning curve but all in all, it went very well. 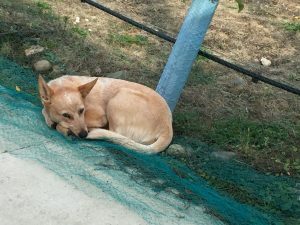 We weren’t altogether sure what to expect but we had a lot of help from our experienced picking crew and “swampers”, the folks who went around and collected the bins full of grapes and brought them back to the winery for crushing. 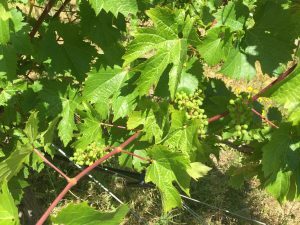 The grape volumes were down a bit in the whites (Bacchus and Pinot Gris) due to the long cold spring which negatively impacted the fruit-set. Fortunately, our long, hot summer helped with ripening and sugars. We were lucky to get everything picked before the monsoon-like October rains started and I ended up with only one wasp sting, while managing the press which was a popular spot for those unpleasant pests. Many thanks to Zac’s dad – Chris, Frank, Cody and the swampers, and Surinder and the picking team who made our harvest go so smoothly. 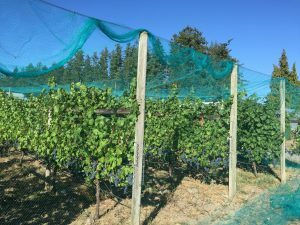 As we approached the fall harvest, we put up the nets around our vineyard to keep out the birds who would eat us into poverty if they were given the chance. The process of putting up nets and closing any gaps or holes takes several days and is quite strenuous, involving a lot of ladder-climbing. There were definitely some lighter moments as we had to free a tangled Vino on a few occasions when she tried to exit a different place than she entered on our daily vineyard walks #puppyshame She quickly proved her worth, however, as she developed a technique for catching the invasive starlings in the nets and, well, you can imagine the results. At the end of August, Zac and I had a chance to join downtown Victoria restaurants and for the third annual Get FED Summer Party in the Fort Common in downtown Victoria. 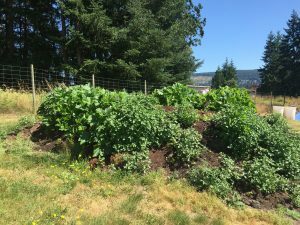 FED‘s mission is to create a district in downtown Victoria that is a destination for sustainable food, full of amazing eateries and a growing number of edible gardens. 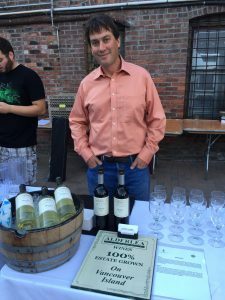 Alderlea Vineyards’ 2016 Bacchus and our newly released 2015 Merlot were served alongside beers from Hoyne Brewing Company. FED members Very Good Butchers, Chorizo & Co, Foo Asian Street Food, Habit Coffee, Olive the Senses, Pizzeria Prima Strada and Yalla were serving up tasty bites to accompany our wines and Heidi and her team did an outstanding job, raising nearly $2000 to support urban agriculture projects in downtown Victoria. We look forward to further collaboration with FED members. 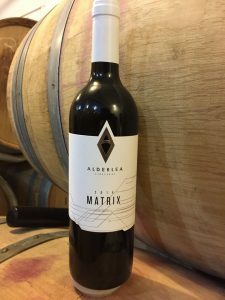 When we took over Alderlea we had a fair amount of red wine in tanks, three years of Matrix and a vintage of Merlot. We were able to taste the wines and tweak the blends a bit. We determined that they would benefit from a bit more oak, as largely neutral oak had been used previously. In keeping with our sustainability mandate, we looked at re-coopered barrels. Over the last two decades, the technology of re-coopering has come a long way. The inside of the barrel is machined away under vacuum, completely removing the wine-soaked and toasted interior surface. The barrel may then be traditionally toasted and reassembled. Being able to re-cooper barrels this way significantly reduces our environmental footprint by diminishing the need to cut down new trees and ship the barrels from Europe. 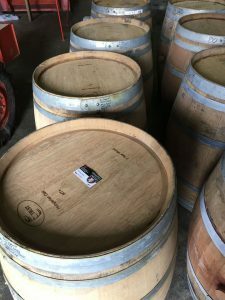 From a winemaking point of view, the re-coopered barrels give all the flavour of a new barrel at only 85% of the intensity, which suits our delicate Vancouver Island reds perfectly. Our barrel program uses 70-80% neutral oak and 20-30% new re-coops on our Matrix and Merlot reds. Our Clarinet is aged in neutral 2000 litre and 225 litre oak vessels. 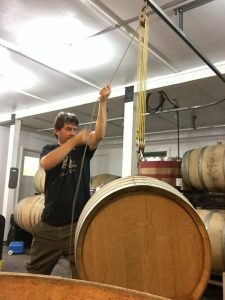 Our 2017 Pinot Noir is 90% neutral oak and 10% second fill re-coops. We are sourcing our re-coopered barrels from Ontario’s DRM Re-coop who have become a trusted partner for our barrels. 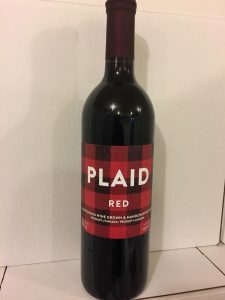 This month, we launched our Plaid wines under our Motovino label at the farmers’ markets in Nanaimo and Parksville. Our aim was to produce approachable, food-friendly blends that could be sipped on a patio or paired with your favourite summer dishes. Plaid is available at the Island Roots Market and through our wine shop at the vineyard. thus far, response to the wines and the label has been extremely positive. For more information about Motovino Wines Inc., check out the Motovino page on our website. So we’re big composters and have been since our time living in Vancouver. When we moved to the vineyard, we were delighted to see the large pile of pomace from the leftover grape skins after each year’s harvest and winemaking processes. Our soil has historically been quite nutrient rich, given that the trees that formerly occupied the land were careful removed by the roots, leaving the soil profile intact. Over 20 years on, it is time to put a little something back into the soil, gently mind you, as we don’t want the vines to get over fertilised and put all of their energy into the vegetation and not the grapes. Enter the pomace or what has now become known as the accidental garden. 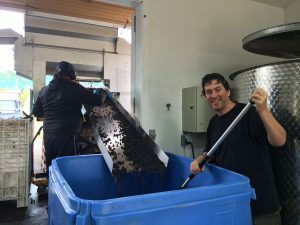 When we came over from Vancouver, we brought our composting bin and proceeded to populate the pomace pile with worms and material from the bin. Low and behold, a few months later, we have a large, unplanned compost garden of zucchini, tomatoes and bell peppers, all originating from our household waste. Everything in the pile seems to be thriving. In fact, the sorry looking Roma tomatoes in our greenhouse may soon be relocated to the compost pile as given how well it’s doing. Most importantly, on the vines we find these little guys: With the warmer temperatures, they are starting to gain momentum. We’ll be tending the vines carefully in the weeks to come to ensure they get enough sun and avoid overcrowding.